I want to give props to Nikie Goomba over on the Blog, "It don't make sense" for this photo. The Economy is stagnant, August 2011 saw zero job growth and a true un/underemployment rate above sixteen percent, and a debt beyond the the scope of human comprehension. What is this guy thinking? I'm no conspiracy theorist but I had to concede that photos like these throw dripping red meat to those who are. 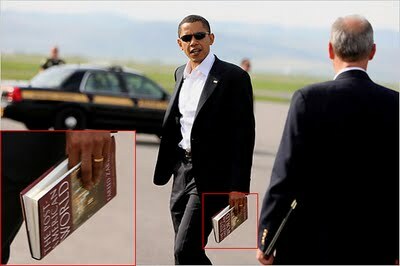 If I were POTUS, this is the absolute LAST BOOK I'd want to be seen with in my hand! For the love of Pete, grab a copy of the federalist papers or something by Thomas Sowell, Walter Williams or Milton Friedman.